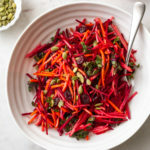 Fresh and colorful, this easy apple, beet, carrot and kale salad is full of nutrition and flavor! Dressing: In a small bowl, combine the orange juice, apple cider vinegar, dijon, onion powder, salt and pepper. Set aside. Salad: Place the prepared apple, beet, carrots, kale and cranberries in a large mixing bowl, pour the dressing overtop and toss to coat. Serve: Place servings in individual bowls and top with a sprinkle of pepitas or sunflower seeds. For cutting the beets and apples, I used this mandoline to cut thin matchsticks. It works perfectly and makes the process easy. There is also a green one that costs a little less, it just doesn’t have the non-slip rubber or groove for placing over bowls.